This article is translated from the book, ‘Pioneers who highlighted the value of World Natural Heritage Jeju’. While the first pioneer in our series, Father Emile Taquet, lived on Jeju for a long time, Ernest Henry Wilson’s visit was much more brief. In fact, his findings and work on Jeju were just one part of an overall body of work that resulted in him introducing over 2000 species of plant from Asian countries to the West. Ernest Henry Wilson’s life started off on February 15, 1876, in Chipping Campden, Gloucestershire. He was the oldest amongst his six brothers and sisters and his father was a railroad worker. When Ernest was young the family moved to a countryside village called Monkspath in Shirley. According to his nephew Roy W Briggs's book ‘A life of Ernest H.Wilson: ‘Chinese’ Wilson’ the Wilson family ran a gardening business in the area. Perhaps because of his parent's work, from early on in his life, Wilson showed a keen interest in plants. In fact, during his schooldays, he won prizes for essays that showed off his passion for plants. This was further ingrained on his walk to school. As his house was in a different village, every day he walked through four miles of lush countryside to school. This gave him plenty of opportunities to come into contact with plants and flowers. This early exposure to nature, plants and flowers meant that at the young age of 13, Wilson was perfectly placed to start work at as a gardener. These tentative first steps into his career in botany resulted in him gaining employment at the age of 16 at the Birmingham Botanical Garden. During this time he also studied at the Birmingham Technical Institution every night. Shortly after graduating in 1896, he won a queen’s commendation and was recruited by The Royal Botanic Gardens, Kew in the following year. Wilson began traveling the world when he started working for a plant nursery as a Chinese plant collector. His work here meant that from 1899 to 1918 he went on various collecting trips to China, Japan, and Korea. While his research in Korea helped Korean plant species become well known throughout the world, it should be mentioned that his work in Korea accounts for only a small part of his career. He collected plants in many countries all over the world, but especially in China. This is where the affectionate nickname “Chinese Wilson” came from. One of the most interesting things about his work in Korea was that Wilson named the Korean Fir tree 'Abies Koreana'. This is despite him finding it during the time when Japan had control over Korea in the early 1900s. Among the plants that grow on Jeju, the Korean Fir, and King Cherry Tree are two of the earliest that were introduced to the outside world. Both of these plants had a connection with Wilson. In his book ‘The Cherries of Japan’ he claimed that he thought the King Cherry Tree was a crossbreed hybrid of the Japanese plants the Oshima Cherry Tree and the Higan Cherry Tree. This theory gained support from Japanese scholars. Much of Wilson’s study of Korean plants came during 1917. During this time he explored Jeju, Mt. Jirisan, Uleungdo Island, and Mt. Geumgangsan for his research. Wilson visited Jeju from the end of October to the middle of November in 1917. However, during this time he struggled to find the King Cherry Tree, perhaps because it was not in season. 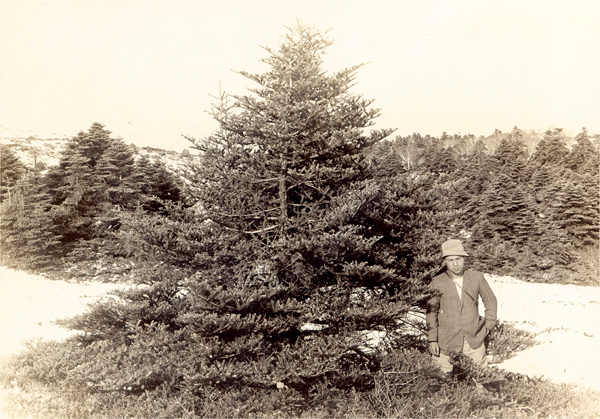 During the visit, Wilson did manage to find the Korean Fir tree, however, and he mentioned that Korea is the only habitat for this species in a 1920 report. He gave the tree the scientific name ‘Abies Koreana’ and published his findings in the first volume of the ‘Arnold Arboretum Research Paper’. When organizing all the specimens of the Korean Fir, Wilson used specimens that he collected on Mt. Hallasan as the name-bearing specimen. As well as this he used specimens from Father U. Faurei, Father Emile Taquet, and his own earlier collections as evidence of the species. Wilson showed interest in exploring Korean flora through studying new types of plants in Mt.Jirisan and Jeju Island. In his records he noted many identifying features of the Korean Fir including its pyramid shape, the fact that the bark of the tree is cracked and rough and that the scales on its cone tilt back more than in other fir trees. Manchurian Fir, Sakhalin Fir, and Veitch's Silver-Fir are three species that share many features of the Korean Fir. However, there are differences in each tree. For example, the Manchurian Fir's bark is less rough than the Korean Fir. It also has a central resin duct and longer leaves. Like the Korean Fir, the scales on the Sakhalin fir’s cones lean back, but they are only green in color and have a central resin duct. Other differences include its clear resin pustules and its smooth bark. The Veitch's Silver-Fir has a similar shape to the Korean Fir but the scales on the cones are shorter. Wilson made summaries of the plants in Mt. Jirisan and Mt. Hallasan and claimed that the Korean Fir is most beautiful in its middle age. This is because during this period the leaves are flourished and the underside of the branches touch the ground and show the pyramid tree shape clearly. Although he was mistaken with his claim that the King Cherry was a crossbreed from two other trees, his confirmation that the natural habitat of the Korean Fir is Jeju means that he will always have a special place in the history of the island. Because of his work, the seeds collected on Jeju were used to grow trees in the Arnold Arboretum at Harvard university.